Combine all salsa ingredients in a small bowl, set aside. Roughly chop corn kernels. Whisk egg white until stiff. Combine polenta, flour, salt, and bicarb in a mixing bowl. Make a well in the centre, add butter, buttermilk and egg yolk. Stir until just combined. Fold through corn and shallots, then egg white. Heat a little oil in a large non stick frypan. Over a medium heat, cook 1/3 cup measures of the batter for 2 minutes or until bubbles form on the surface, turn and cook for a further 2 minutes. Keep corncakes warm, repeat with remaining batter. 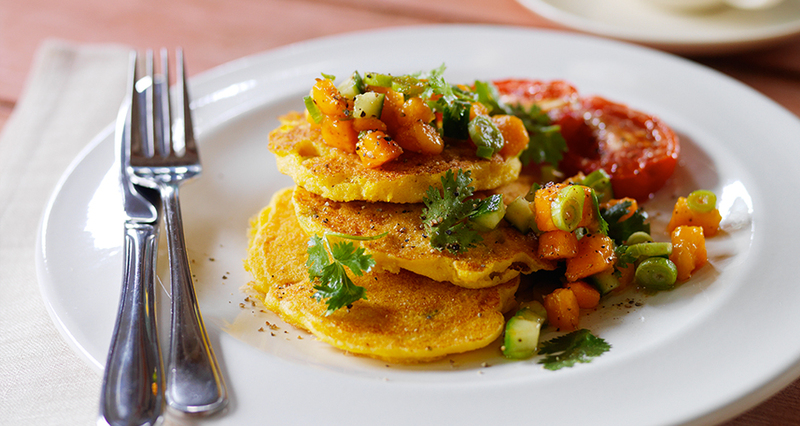 Serve corncakes stacked with roasted tomatoes and yellow papaw salsa. © 2019 Papaya Australia. All Rights Reserved.